It may seem an odd question, but if we put it in the context of a networking event it should start to make a bit more sense. You arrive at an event, you want to develop your network, you want to meet an engage with people who you hope can help you to develop your business. Putting the often forgotten benefit that business networking is a great place to simply meet other like-minded business people to share ideas, problems and solutions and make new friends, we are all hoping to find new leads and generate new business. So who in the room is a potential client? The great thing about networking is that 9 times out of 10 you simply don’t know. Maybe that room of 30 people is actually a room with half a dozen potential clients, not necessarily now, but in the future. So that’s it…..well actually, no it’s not! Who else might help you develop referrals? What about those businesses that target the same types of clients as yourself? What about the businesses that work with your potential clients, providing a complimentary service to your own? These are the types of people who might not place any business with your directly, but could help you get work indirectly. Ok, let’s say for the sake of argument that there’s another half a dozen businesses in the room that could help you indirectly, we’re now up to 12 out of 30, the percentage is looking up. OK, so now we’re done? Actually No! Who else might you work with? 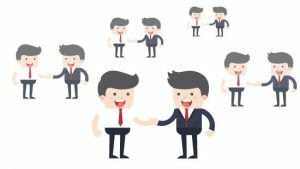 So you wander the room, introduce yourself to someone new and guess what, they do the exact same thing as you, delivering the same service or selling the same product. Great, you think sarcastically, let’s move on quickly. Stop! It’s all too easy to see your completion as your enemy, your nemesis, someone you simply don’t want to waste time talking to, but you could be very wrong. Take the time to get to know them. Not from the point of view of identifying their weaknesses so you can destroy them later, but to see if you can better understand what they are about and there are two good reasons to do that. Firstly, as a business you may offer a whole range of products or services, some you are really good at (and you enjoy delivering), some you can deliver well enough (and don;t mind doing), and some you simply offer to provide a one-stop shop, but you’re not particularly good at (in fact you don’t even enjoy delivering them). The key here is that there could actually be some synergy between your companies. There could be opportunities for you to work together, helping each other with the products or services that you don’t do that well, those products or services that you’d rather not deliver anyway. So there could be opportunities to complement each other. Secondly there is the issue of resource. Maybe you could help each other when deadlines are tight and resources are low. Obviously having a “competitor” work with one of your clients demands a lot of trust. 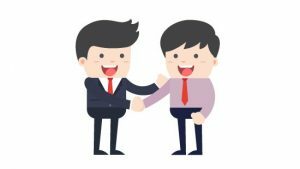 You don’t want them running off with your client, but with an open mind (and the right agreements in place) you could both benefit from such an arrangement. So suddenly the rooms gone from 6 people out of 30 worth talking to maybe 15, a jump from 20% to 50% of the room! OK, these numbers are hypothetical, but you get what I mean. Indeed if you take these thoughts on board next time you’re networking you might just find you start to get a lot more out of it.